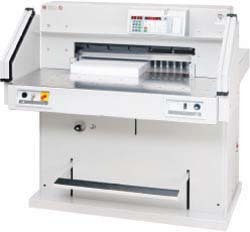 A Hydraulic Paper Cutter is an important tool for any print shop. 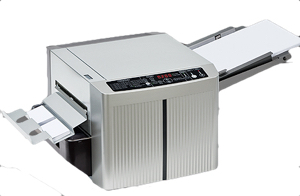 It can help you cut stacks of paper, card stock or laminated documents. Sometimes, you need a big cutter to finish down a big print job. A tabletop guillotine cutter will not do the job. Even a sophisticated creaser, slitter, and cutter is not enough for some projects. Today, the machines are pretty sophisticated. 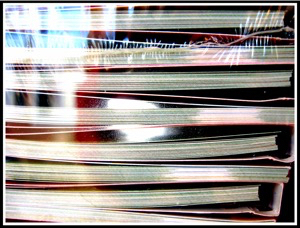 Not only do they have all the safety mechanisms built-in to ensure no one accidently cuts a hand or finger off, (Your insurance company appreciates this) you can program up to 99 different cuts for regular projects. The advantage is you can train anyone to run the cutter. All you need to do is show them how to adjust the paper, the measurements are only done once. 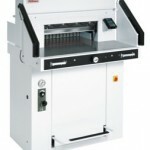 It is a programmable cutter with hydraulic blade and clamp drive with a maximum width of 21” 5/8. It has a comprehensive SCS safety package. What makes a hydraulic cutter so precise is the electronic blade activation bars allowing for true two-hand operation of the machine. It has an IR light beam safety curtain on the front table, safety cover on the rear table and a lockable main switch. You can program up to 99 different cuts to make it safe and accurate every time. You can train anyone to operate the cutter. They just have to be taught which way to turn the paper while cutting. Also, you can order optional work tables to install on the sides giving you more room to maneuver your project. This is the bigger version of 5560 as it allows a maximum width of 28” of cutting. It comes with the same SCS safety package as the 5560 with the IR light beam safety curtain on the front table. Digital measurement display (cm or inches) with multilingual operator guidance, accurate to 1/10 mm or 1/100 inch.It too stores 99 programmable cuts with up to 99 steps in each program. It is pre-programmed for standard paper sizes. Electric blade drives with solid steel carrier and adjustable guides. Electronic hand wheel with variable speed control for manual back gauge setting. Clamp pressure is fully adjustable between 550 and 4,400 psi. The false clamp plates with the optical indicator. Bright, LED optical cutting line. 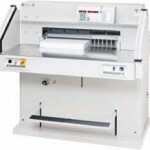 A hydraulic paper cutter is a must have for any print shop. If you would like to get a smaller cutter, both MBM Triumph and Formax Cut-True can do the job too.